Nigerians have started stockpiling food ahead of the ultimatum issued by the Nigeria Labour Congress and the coalition of the civil society organisations that petrol price be reverted to N86.50 or all workers would embark on a strike. 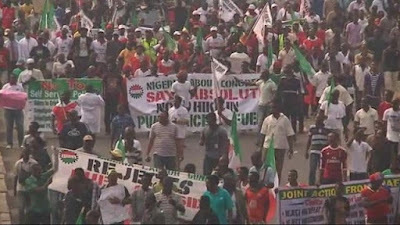 On Saturday, the organised labour again repeated that the President Muhammadu Buhari-led Federal Government had till Tuesday night to reverse the increase in the price of fuel from N145 to N86.50 or face a total shutdown of the country. The three-day ultimatum was first announced on Friday. PUNCH that they were getting prepared for the strike by buying enough food in their homes. A businesswoman based in Osogbo, Osun State, Mrs. Mayowa Bamisaiye, said she was ready for the strike because she had expected it after the Federal Government announced the new fuel price. ‘‘I do not agree with the new increment and I expected the labour unions to resist it. I have bought some food and I will buy more that will be enough to cater for my family during the strike. I also intend to withdraw some money to cater for some domestic needs as the strike lasts.’’Also, a human resources officer in a non-governmental organisation in Ibadan, Oyo State, Mr. Paul Sodeinde, said he was prepared for the strike. ‘‘I have enough fuel for my generator. There is food in the house and water. I am ready to endure the strike for as long as it lasts.’’The story was the same as most of the people that spoke to Punch in Lagos said they had started making preparations for a long stay at home. Are you ready for the strike too?